grandma's cookie jar: Special Christmas Give-Away - Chef Pop de Pop Game! Special Christmas Give-Away - Chef Pop de Pop Game! Yes, I have another fun give-away to share with you today for my month of special Christmas give-aways! 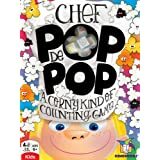 This time it is for a new game from GameWright which will have children "popping" out of their seats as they add and subtract in this "corny kind of counting game": Chef Pop de Pop! Fun game which gets children adding and subtracting! GameWright says, "Butter up for this freshly packed game which is bursting with fun! Shake the shaker and then count up the popcorn on the dice. Collect your cards if the total matches any of the flavors. Watch out for burnt kernels and if you spot the "POP!" get ready to jump out of your seat in a jiffy! Stack up the most cards and munch your way to a win!" Chef Pop de POP is a fun game for children and families to play together and I'm very happy for the opportunity to give one away (USA only)! If you are 18 and older and would like to be in this drawing which will be on December 5, 2013, all you have to do is at least one of the following: follow on Google+, Google Friend Connect, follow by liking on facebook with the tab at this link (not just liking the post) and/or have followed grandma's cookie jar by email. For each of these which you have done you will receive one entry. In addition, if you "share" this post, you'll receive an additional entry (please let me know if you share!) This will help me be able to draw names from among people who would like to win Chef Pop de POP and it gives you several ways to enter the give-away! My family is a family of "gamers" and love family game night...what a great addition this would be. I follow on fb and email. Always looking for new ways to get the kids excited about learning! Thanks for the giveaway. I follow on email, shared on Facebook (and liked), and Google+.